Sopladora con ventilación a chorro de 40 V y 500 pcm está calificado 4.8 de 5 por 43. Calificado 5 de 5 por andy2434 de Have to love it! For years I have been down on bent knees picking up leaves and debris in my front and backyard. I finally decided to try this battery powered blower. Well, I am more than pleased with my purchase. It is a tremendous blower. 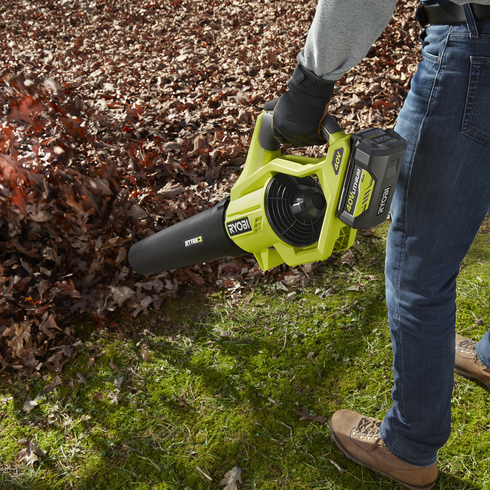 It has lots of power to blow leaves out from under the layer of rocks, which cover my planted areas. Now, it's a breeze, pun intended, to clean up my paver covered walkways, garage, and patio areas. Gotta love it! This blower packs a big punch even without using the turbo mode and the battery definitely last a long time. This blower will cut down my yard clean up time significantly. Very happy with this tool. Calificado 5 de 5 por kbro12345 de Great small powerful blower. I got this blower to clean sawdust off of my woodworking tools. I was tired off dragging out my corded blower just for a few seconds of use. This has a great amount power to clean up quickly. I wish it had some additional attachments to allow for a finer blowing area. Another plus is the charger is reversible to power/charge USB powered devices. The few negatives that I have are it is very loud with the turbo boost option and you cannot lock on the turbo boost function. Calificado 5 de 5 por paulswain81 de Very Powerful! I bought this today and almost blew off my dad's toupee! This blower has so much power and the 40V battery will last longer than my Telsa! Awesome product every man needs one in the shed! Thanks Ryobi! Calificado 4 de 5 por dggh de Just as useful as the small engine blower I am casual weekend user. Great product for my needs. Done with pull cords! Calificado 5 de 5 por Tendo de Power! Switched from electric to battery and man am I pumped! Calificado 5 de 5 por Knightro de Great Performance/Value I've had this for a couple weeks now and use it a few times a week to clear leaves off my driveway and deck. I've had the 40V Expand-It trimmer for over a year, and it's still working well, so this was a logical next step. The only negative thing I have noticed so far is the nozzle does not fit very snugly to the fan, but that does not affect operation of the product. I would recommend this product for someone like myself who prefers the convenience of battery powered lawn tools. Calificado 5 de 5 por Marty W de Great Blower, get it! I thought I would never get a battery charged blower, but with technological advances, so has the power in the battery of this blower. I get the same power that I did from the my Echo PBR252 but am so happy that I never have to worry about gas, spark plug, and simply worrying about it starting after sitting in garage over winter. LOVE IT! Calificado 5 de 5 por Chiefengine1 de WOW this thing is powerful This blower was definitely what I needed to get the leaves hung in behind bushes. This 40V 500 CFM jet blower was the most powerful on the shelf. Last long and just the right tool for the job. La sopladora 40V 500 CFM define la practicidad de GAS-LIKE POWER™ y de ser inalámbrica. Reunimos todo lo que las personas adoran de nuestra sopladora más vendida y la mejoramos. Esta sopladora aporta más potencia, más tiempo de funcionamiento y es más liviana que el modelo anterior. Con tecnología de ventilación a chorro™ como su principal característica, esta sopladora innovadora brinda 500 CFM de potencia de limpieza. Características como el control de velocidad variable y el botón turbo le dan mayor control de potencia para trabajos de limpieza grandes y pequeños. La sopladora con ventilación a chorro 40V 500 CFM no le hará extrañar la gasolina.